The ATS, or automatic transfer switches, are basically the go-between utility power and generator power. There is a common load fed from the transfer switch usually to all your emergency panels. During a test or an actual power failure, there is a time delay before the ATS sends a signal to your generator, starting it. When the voltage and frequency of your generator is acceptable by the voltage sensing network, it sends a signal over to the mechanism. It will open up normal power and then close the generator. Now you’re online and everything is stable at this point. When normal power, or utility comes back online there is a time delay preventing the generator from switching back – just in case normal power is unstable for a while (usually 10 minutes is a good number). After 10 minutes of voltage sensing in your digital display is acceptable for utility it will send a signal to the mechanisms once again. It will open generator first, close normal power, and now you’re back on utility. The generator will cool down for a certain amount of time and then you’re ready for the next power failure. The ATS is the heart of emergency power. 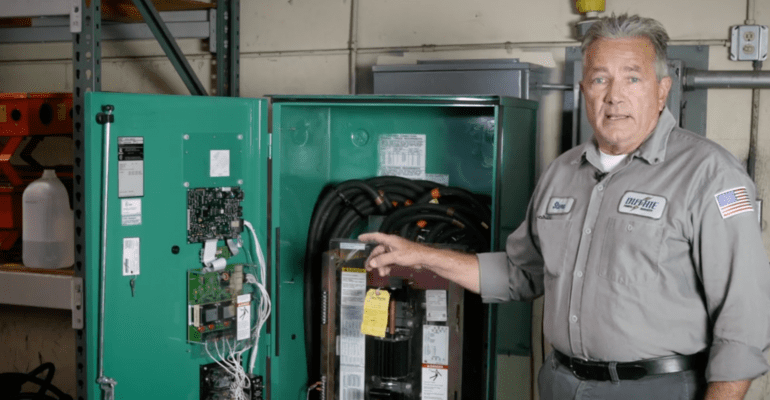 Your generator has to be in good shape for the transfer switch to accept the power and it also has to be up to snuff for utility to be accepted by the power – but nothing happens without it.